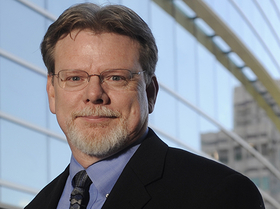 Michael Minear, chief information officer of UC Davis Medical Center in Sacramento, Calif., has a talented security staff, and as a result, has suffered some consequences. “We had a team of five, and two of them got poached,” Minear said. “It took a year and a half to replace those two.” That's not an unusual experience. The market for cybersecurity workers is red hot and that's putting heat on the healthcare industry, which has lagged other industries in information-technology spending. But after a spate of massive cybersecurity attacks this year, the industry is scrambling to shore up its defenses. Its efforts, however, are hampered by stiffening competition for experienced cybersecurity professionals. As a result, cybersecurity professionals are fetching a 9% pay premium over other IT workers, according to Burning Glass Technologies, a Boston-based human resources technology and support services provider. 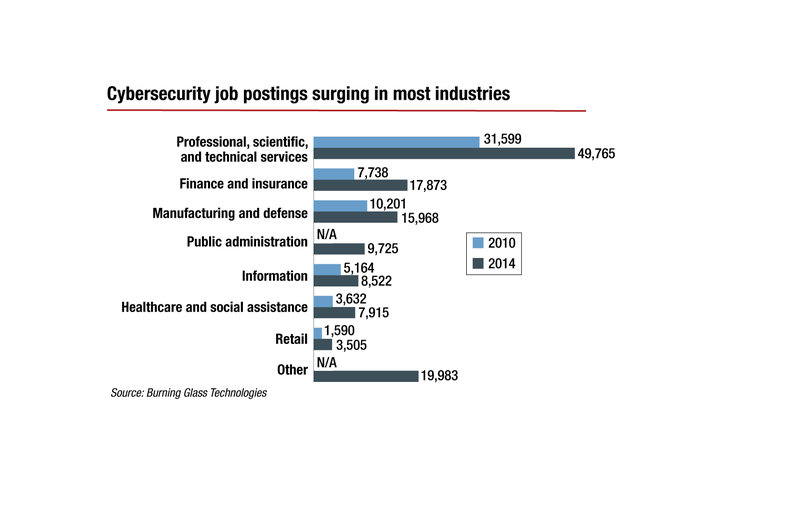 According to Burning Glass, there were nearly 50,000 job postings in 2014 for workers with a Certified Information Systems Security Profession (CISSP) designation, the primary credential in cybersecurity work, which requires a minimum of four to five years of field experience. But the number of openings represents three-fourths of all cyber pros with a CISSP designation, even though globally the number of CISSP designees has nearly doubled since 2010. “Saying you're going to fill those 50,000 jobs playing musical chairs with 65,000 people doesn't really work,” said Burning Glass CEO Matt Sigelman. Those CISSP jobs pay an average of $93,000 a year and carry an $18,000 premium over entry-level security positions that require the basic credential, Sigelman said. Healthcare cybersecurity specialists need to be familiar with technology as well as the federal Health Insurance Portability and Accountability Act, making an already-rare set of job skills even more scarce, Sigelman said. The healthcare industry is creating ways to keep an eye on valuable personal and medical records as it struggles to hire cybersecurity personnel. 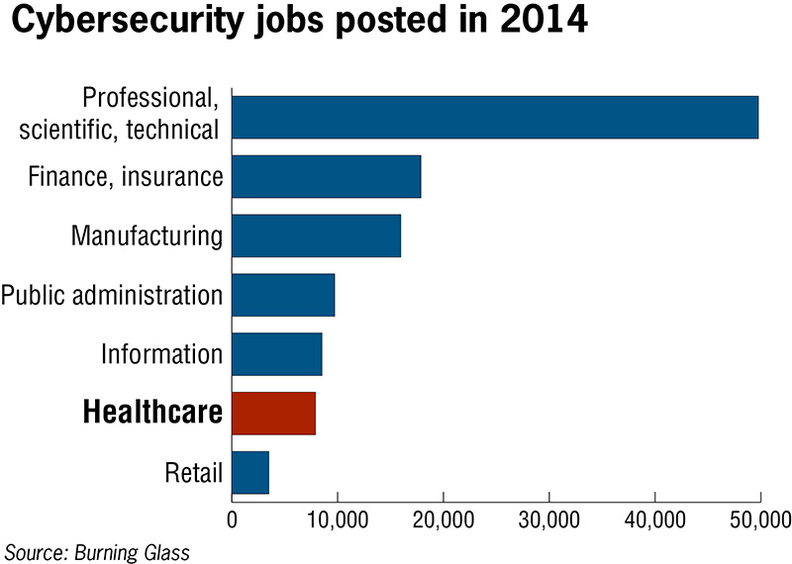 Cybersecurity job postings are up 91% since 2010, with 238,000 such jobs listed in 2014, including 7,915 in healthcare and social assistance organizations, such as drug and alcohol abuse clinics, Sigelman said. The demand is, in part, a reaction. According to the official “wall of shame” federal website, since September 2009, there have been 1,345 breaches reported in which 500 or more patient records were involved. A total of 153.9 million health records have been exposed. That number approaches half of the U.S. population. Four out of the five largest breaches on the list were hacks, all of which occurred in 2015, accounting for 75% of all records exposed. The largest hack was reported by Anthem and involved a whopping 78 million records that affected not only members, but through reciprocal payment agreements, some members of every other Blues plan in the country as well. For educators and trainers in cybersecurity, that means business is booming. Publicly funded University of Maryland University College, an outgrowth of the University of Maryland, claims more than 8,000 students have enrolled in its 13 cybersecurity programs at the certificate, undergraduate and master's degree levels. Of those, 4,500 students have graduated since the program started in 2011, said Robert Ludwig, assistant vice president of media relations for the college. Last year was the first year they've actually seen graduates go out in the market, Ludwig said, but it's been tricky keeping track of where they're headed. He said an alumni roster of 2,000 graduates shows only about 2% seem to be employed in jobs that are clearly healthcare-related. Minear says the breaches have upped the ante. “I work in healthcare, but now I feel I work at the NSA,” he joked, referring to the National Security Agency, the top-secret Defense Department agency that specializes in cracking codes and electronic spying. After reading a 2008 article about a breach involving unencrypted backup tapes of records at another university healthcare organization with “a very good CIO,” Minear started on a path to “encrypt everything,” from data in motion to data at rest. “We've invested about $11 million in security technology over that six or seven years, and in our security plan, we have to spend $4 million to $8 million more,” Minear said. That funding will include combining cybersecurity monitoring operations at UC Davis and other UC Health campuses. The plan is to create a security operations center. SOCs, as they are called, enable cybersecurity personnel to watch over a number of organizations, just as teleradiology allows a single radiologist to perform imaging reads for multiple hospitals. This cuts costs and creates efficiencies, security experts say. Matt Eversole, chief operating officer of information technology at 23-hospital Mercy Health, said his health system is exploring a SOC. He expects in the next two years the system will need to double its cybersecurity workforce from 17 to 34. Eversole said his system, based in Cincinnati, recently lost its chief information security officer, who resigned to become a consultant. “It took me three months to recruit a replacement,” but that was about the time expected for a position of that level, he said. And the pay was within range. “We did pay higher, but not much higher,” he said.